Every beginning is hard. The 2mm flesh tunnel. You start the stretching process using a 2mm tunnel. A traditional earlobe piercing has a size of 1mm to 1.2mm. 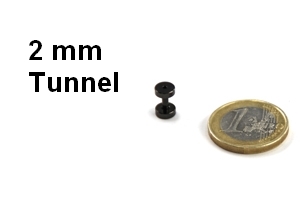 If you are afraid of stretching directly from 1mm to 2mm you can use the intermediate size of 1.6mm instead. This step is very important because this way you realize pretty fast if stretching your earlobe is your cup of tea. You should be very careful when you are stretching your pierced earlobes. Stretch it slowly and take your time to wait until the healing process is finished. Later when you have larger flesh tunnels you will be able to stretch your ear lobe in millimetre steps. The flesh tunnel size 2mm is a very nice one. Because the flesh plugs and tunnels are so small the look is subtle and cute. But you can look forward to the next step. Because from 3mm you can select from an even larger range of flesh tunnels and plugs here in our shop.